Ladies of the Victorian age would be gushing over this green amethyst gemstone ring. Apples of Gold presents a uniquely crafted Victorian-style ring that beautifully blends the extraordinary green amethyst stone with gleaming silver. The gemstone is given a round cut for excellent brilliance and casts a lovely pale green color. An elaborately decorated band of silver elevates this piece to truly elegant status, and shows off lovely filigree design with milgrain lines and open-air patterns. 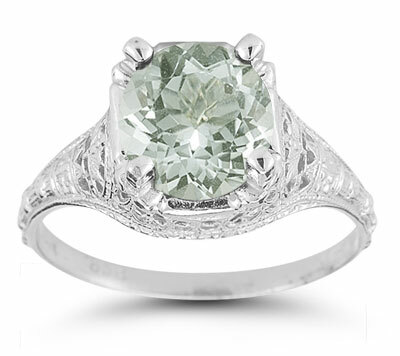 We guarantee our Antique-Style Floral Green Amethyst Ring in Sterling Silver to be high quality, authentic jewelry, as described above.